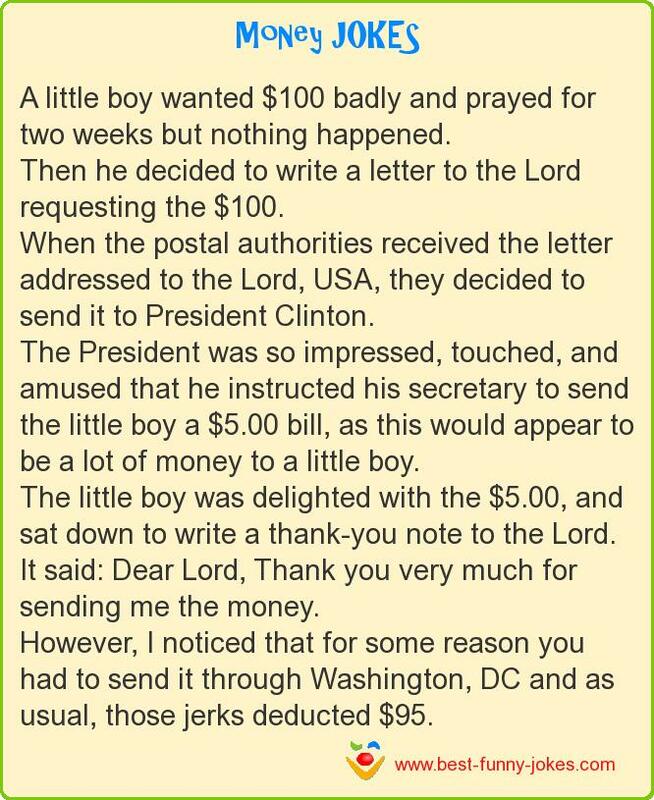 Then he decided to write a letter to the Lord requesting the $100. When the postal authorities received the letter addressed to the Lord, USA, they decided to send it to President Clinton. The President was so impressed, touched, and amused that he instructed his secretary to send the little boy a $5.00 bill, as this would appear to be a lot of money to a little boy. The little boy was delighted with the $5.00, and sat down to write a thank-you note to the Lord. It said: Dear Lord, Thank you very much for sending me the money. However, I noticed that for some reason you had to send it through Washington, DC and as usual, those jerks deducted $95.